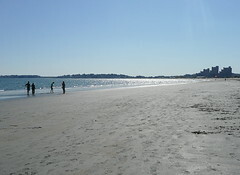 This weekend, looking for a close-to-home change of scenery, J and I took the T to Revere Beach to stroll, stare at the sand and surf, and collect snapshots of sun-soaked gulls, dog-walkers, and sailboats. Both J and I are native inlanders: J grew up in Pittsburgh, PA, and I hail from Columbus, OH. Because we weren’t raised with the ocean at our doorstep, both J and I tend to forget how close to the edge we currently live. For us, the ocean is somewhere you visit on vacation, either via a ferry to Provincetown or a plane to San Francisco or Santa Monica; we typically forget, blithely, that in Boston, the beach perpetually beckons. I know native New Englanders who insist they could never live further than a short day-trip from the ocean, the smell of salt and sand being essential to their personal happiness and well-being. Although I can appreciate the sentiment, it’s not one I share: as an inlander, the seashore is an interesting but alien place, an exotic location appropriately peopled in my imagination by wild women and wise guys. Revere Beach is a place where “townie” isn’t an epithet but a badge of honor. As we stood in line at Kelly’s Roast Beef–a culinary landmark since 1951–I gestured discreetly toward the people around us, asking J a simple question: “McCain or Obama?” The folks waiting in line at Kelly’s represented a mix, J and I guessed, of red- and blue-state: middle- and working-class white folks with conservative values and Democratic loyalties. During my weekdays in Keene, I work alongside academics who automatically assume everyone’s for Obama; if I want to remind myself how the other half votes, I envision the flatlands of my Midwestern youth, where Joe Six-Pack lives. But even a state as blue as Massachusetts, the quintessential home of northeast liberals, contains political pockets as far removed from the Cambridge intelligentsia as Ohio is from New England. You don’t have to travel far to experience a completely different world and worldview if you’re willing to eat, when in Rome, as the red-meat Romans do. Sometimes even a short staycation–a subway ride there and back, capped with an afternoon stroll–is all you need to shake yourself out of your sameness, a subtle change of scenery reminding you that the entire world doesn’t look like your backyard. It takes all kinds, not just my kind, to make a world, and both the ocean and sky are infinitely wider than anyone’s worldview. 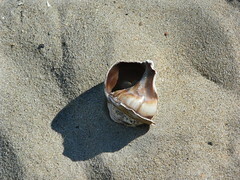 Beaches are big and afford enough space for all kinds: dog-walkers and sailors, beach bums and bookworms. 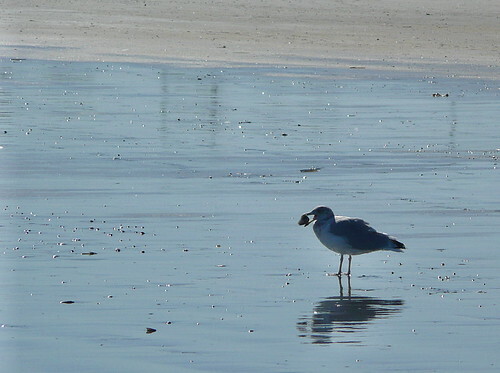 Beaches, like God’s mind, are wide enough to contain seagulls, surf, and infinite grains of sand, each bespeaking the myriad souls who have strode the edge between this world and beyond. 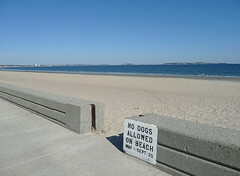 Click here for a photo-set of images from a sunny Sunday at Revere Beach. Enjoy! 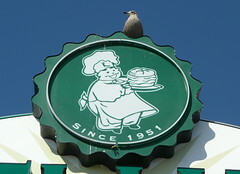 Revere Beach is a place where “townie” isn’t an epithet but a badge of honor. The same is apparently true in Walla Walla. That last paragraph was a wonder. I have been to the beach in Boston and have seen the sand sculpting completion it was amazing and I had a very nice experience . Also I loved how you described the beach with these wonderful paragraphs and good pictures.